Well it's finally Autumn, my favourite season, but that's no reason not to still create pages with hints of Summer right? The collage sheets from Mrs Brimbles Patreon are stunning and allowed me to do just that. 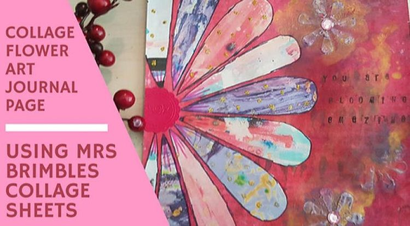 I have created a page by cutting up her artwork collage sheets that she created originally for canvas work. I must say I love the final result of the art journal page. 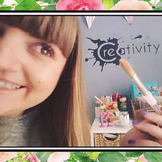 The page I have created is for a Travelling Art Journal Circle over on my Facebook group Kerrymay._.Makes a Mess. I was sent a stunning book from the person before me in the circle (Sarah Gamble), I was really scared of ruining the page and paper. 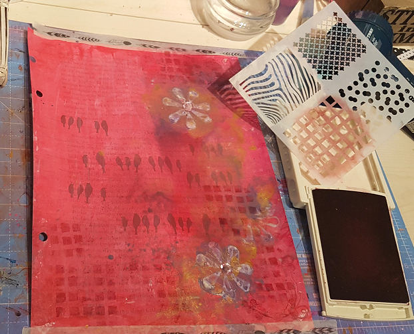 I applied a thin layer of red hued acrylic paint which I added to the page using a brayer roller. I went over this with white acrylic paint to dull down the colour and allow the background of the page to peep through. 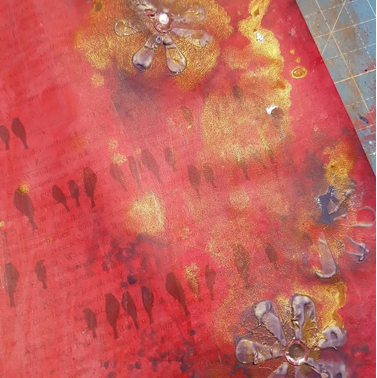 I then used a stencil which came free with a magazine and applied heavy texture paste to create small flowers. 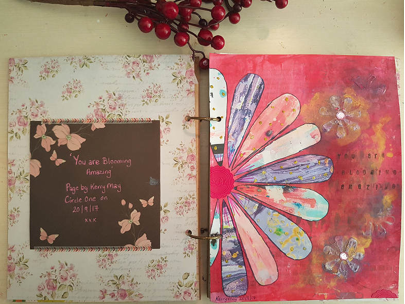 Next I used some homemade spray inks over the flowers and to the right of the page to give it texture and shine. I think the gold spray in particular looks lovely and really makes the page pop. A little gem was used in the centre of the two mini flowers for added sparkle. 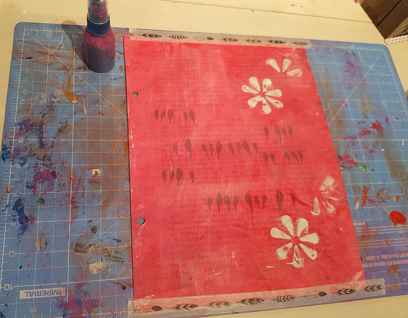 Next I used a stamp pad and stencil/mask to add more texture to the page. Now came the fun part: adding the collage sheets. I printed off the canvas artwork sheets then put them all together and held together with a paperclip. I then drew a flower petal shape on the top layer and cut this out so that I had 10 cut out pieces all identical. I then arranged and glued them in a flower formation to the left side of the page. I added detail using a standard black and purple felt tip and then added some gold glitter glue blobs to add a bit of bling. 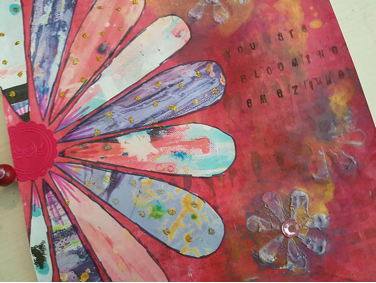 Finally a circle vinyl sticker for the centre of the flower was added and I used individual letter stamps with black ink to add my caption to the page: 'You Are Blooming Amazing'. I love the way the collage sheets really bring out the colour in the page, they look so textured. The final page looks lovely in the book I was given to create the page. I hope the recipient likes it. 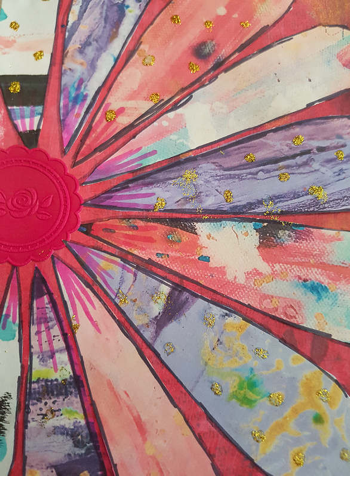 In addition to the lovely artwork collage sheets, Anna has provided a multitude of other stunning collage sheets using her own artwork. There are the beautiful Autumnal animal paintings that you may have seen on The Happy Place... I am saving these for my next post though as I plan to do a spot of Autumn creative journaling and dashboard making. Thank you for reading, do check out the amazing collage sheets and videos at Anna's Patreon here.